Spend any time on Japanese websites, blogs, and forums, and you'll eventually see it: ありがとう任天堂. 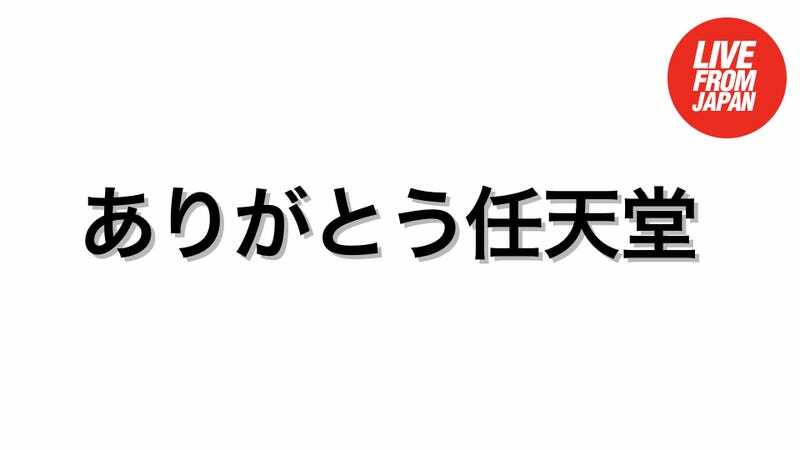 It means "Arigato Nintendo" or "Thank you Nintendo". "Arigato Nintendo" is a meme in Japan. It first appeared on popular Japanese game site Sinobi in 2009 in a piece that detailed the staggering first day sales of New Super Mario Bros. Wii. The phrase was originally intended to praise Nintendo. It soon took on a life of its own. There are many things Japan should thank Nintendo for—countless things, even—but not for everything. When Japanese gamers write "Arigato Nintendo" in a forum, they might mean it. This generation, Nintendo has released a slew of fantastic games and brilliant hardware. However, there are also Japanese gamers who detest Nintendo or the blind allegiance to Nintendo and ironically fire off an "Arigato Nintendo" when the company makes a mistake or does something unpopular—yes, the phrase can also be used to troll Nintendo. There's a notion in the West that all Japanese gamers like Nintendo. This is far from the truth! However, the vast majority of them do grow up playing Nintendo games—especially nowadays. This isn't the first time Nintendo defined a generation. During the 1980s, Nintendo defined video games. With the success of the Family Computer (AKA the Famicom) in Japan, the Nintendo became like Coke, Xerox, or Kleenex: synonymous with the product it sold. You don't quite see the same "Arigato Sony" sentiment online in Japan. Even if that sentiment exists, you only tend to see it when new hardware is released (or if The Last Guardian ever comes out) or when Sony bags third party exclusives. That's pretty much it. That being said, in Japan, there is still very much a "cool" factor around Sony gaming hardware that Nintendo doesn't quite have. It's not because Nintendo hardware is uncool, but rather, because of the baggage Nintendo has. Since many parents buy Nintendo portables for their kids, the prevailing stereotype is that Nintendo hardware is for children. This, too, is totally untrue! However, this is why you often see junior high school kids and high school kids with PlayStation Portables, as though they've "graduated" to the device. This could (and probably will) change as, for example, more titles like Monster Hunter 4 hit Nintendo's portable. Yet, that emotional attachment to Sony and Nintendo are not the same. If you are thanking Nintendo, you are thanking the company for its hardware and the games that it's made on that hardware. You are, in a way, also thanking Nintendo for video games, end point. Most of the gratitude towards Sony would be for the hardware and the games it has gotten onto that hardware. The nuance is different. The companies are, too. The Kyoto-based card maker has dabbled in several businesses—from taxis to love hotels—but video games would prove to be its greatest success. But Nintendo and their games weren't simply popular electronics; they were cultural ambassadors. Sony was also a great ambassador during this period, but it wasn't shipping pure, uncut pop culture per se, but instead, devices that enabled you to consume pop culture made by creators and artists of your choice. During the 1980s, as Japan-bashing took hold abroad, kids in America and elsewhere were directly exposed to Japanese popular culture—a culture that soon became global—through Nintendo. Many gamers probably didn't think about where Nintendo was based, who was building these consoles, and who was designing these games. Those that did, like myself, perhaps became interested in a country that appeared so different from their own, yet so similar thanks the game's universal appeal. For a game company that made such international hits, it often didn't seem very international at home. Nintendo isn't just a very Japanese company, it's a very Kyoto company, making it seem even more insular. While rival Sony frequently hires non-Japanese employees in Tokyo—it even had a foreign CEO—Nintendo Co., Ltd. seems to prefer to have its non-Japanese employees work at its overseas branch offices and keep its headquarters nearly all Japanese. Heck, it was even a big deal when the Kyoto company had Satoru Iwata, who was born in Hokkaido and not directly connected to bossman's family, take over the reigns. In the past, this has seemed to translate to Nintendo's relationship with outside developers—Japanese and abroad. Many gamers buy Nintendo hardware to play Nintendo games on them (unlike Sony consoles which people buy to play video games on). Western gamers look at Mario and claim the character as one of their own. It's similar to how Japanese sometimes see "Western" things, like blue jeans, rock music, and hamburgers. They don't look at them and immediately think "foreign" or "non-Japanese", as they've grown up on all three. (Once one of my son's friends earnestly asked me if there was McDonald's in America.) Likewise, gamers who have grown up on a steady diet of Mario and Zelda don't look at them as being "Japanese". They're Mario and Zelda. What compounds the problem is that every summer, Nintendo rolls into E3, the huge gaming expo in Los Angeles, and shows off its latest games and hardware. Then it neglects the Tokyo Game Show entirely, giving the whole thing to Sony and Microsoft. Microsoft is a non-starter in Japan, and the console, while it has its Japanese fans, is largely a non-issue. Nintendo's decision to skip TGS year after year makes the Japanese game industry appear weaker than it really is. It's baffling. What's also baffling is that Nintendo seems to be increasingly reluctant to do fan events in Japan, basically relying on television commercials and in store kiosks. This lowers the image and hurts the entire Japanese game industry. Every year, Nintendo seems to do better and better, while in the West, people claim that the Japanese game industry is getting worse and worse—completely discounting the fact that Nintendo is headquartered in Japan. While well known Japanese game creators are trying to show some fight in them, announcing big games to show what Japan can do, Nintendo doesn't seem as interested in participating in the discussion. Like I said, Nintendo is very much a Kyoto company. It's off doing its own thing. It's weird. Nintendo seems so international. Yet, the company, in many ways, is not. There's a disconnect. People are down on Japan. They are not down on Nintendo. This would be a perfect opportunity for Nintendo to do some cheerleading for the country's game industry to and for Japanese gamers. That might mean showing up at the Tokyo Game Show, or even holding more of its own events across Japan. Just, something.